Do I HAVE To Read E-Books? Part 1: Are Print Publishers Really Doomed? Part 2: Are Print Books Really Doomed? Part 3: Do I HAVE To Read E-Books? Part 4: Do I Have to Buy Indie Books? Do you have to read e-books and not print books? No, of course not. Not for the next few years, anyway. 2. the technology for displaying the books is improved. PDF does okay, but it doesn’t interact with the reader at all. Consumers will become used to e-book formats that allow interaction, animated graphics and more. Either Adobe will have to ramp up its PDF format to meet the demand, or another format will come along. And it won’t be e-pub. Not for the big text books. Currently, the popular fiction market is blazing the way as far as electronic reading is concerned, so when it comes to being forced to read e-books, your novel-reading may head in that direction sooner than you think…or currently want. But there’s some very good reasons to start thinking about making the change to e-book reading voluntarily, and sooner, rather than when you get pushed, kicking and screaming, over to having to read e-books because the print books have all disappeared. There’s no way to sugar-coat the reality. Eventually, everyone will be reading books electronically. This may sound like the bells of doom to you, but focus in on the silver lining: Eventually. This is good new for you, if you’re a die-hard print book reader. Why? Because that puts the control firmly back in your hands. 2. No one really knows exactly when that is going to happen. It’s coming, but even the best industry predictors wouldn’t be able to pinpoint it. 3. This means you can decide when you switch over to e-book reading. You make the call. Not the publishing industry and the end of print books. Here’s a few things to think about. All popular fiction titles are already produced in both e-book format and print. If you start buying the e-book version now, then in five years time when you would have been forced to starting buying e-books (or however long it takes), you won’t have to spend a small fortune replacing all your print books with e-books, because you will already have them. Your print books won’t last forever. They eventually fall apart, the pages yellow, get brittle, the books are borrowed and never returned, the glue dries out…and when that happens, your only choice will be to replace them with e-books. Why buy them twice? Buy the e-book now. E-books last forever. Given that older people are less comfortable with big changes in their lives, and the young adapt more easily, making the change over to e-books now while you’re younger gives you a fighting change of adapting to the new way of reading. You’re already resisting. Perhaps fighting it hard. What are you going to be like in five or ten years, when you’re really settled into your life and routines? Because you’re picking your own time to trade over to e-books, instead of being forced into it, it gives you time. Time to take it slow, get comfortable and ease into it. Research, ask lots of questions, dip your toes into the water an inch at a time and retreat as necessary. By picking your own pace, you can acclimatize and adjust as you wish. Experiment. 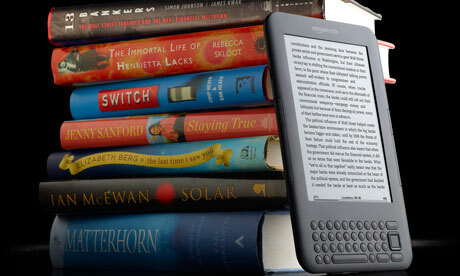 Borrow different e-reader models from friends and read a book or two until you find one you think you could live with. Drive sales people crazy with a million and one stupid questions, and don’t walk away until you have all the answers you want, until you understand. Research on-line about e-book reading, e-books, e-tailers, managing your e-books and more. You’ve shunned the e-book world. Now it’s time to enter into it. Be smart, get comfortable and knowledgeable, so you feel like a (semi) expert when you take the plunge. It’ll help enormously. So will the knowledge that you’re taking the step into e-books voluntarily. Remind yourself that you’re making a choice, not a sacrifice. 3. The one fact about sweeping technology advances is that they happen fast, and go faster every decade. I don’t mean to rush you, but I keep talking about five years for a reason. A lot of industry pundits say it will be a decade before publishers stop printing paper books altogether, but one thing I’ve seen over the years is that pundits play it safe, and technological social advances always get sucked up by the masses faster than anyone thought they would. So I’m saying five years, the pundits (those that are predicting it at all – try J.A. Konrath, for a start) say ten, and the actual figure may be somewhere in between. Paper books aren’t going to disappear overnight, but I bet you a virgin bloody mary (hold the veggies) that the print edition of individual titles will start disappearing next year. 2012. That’s how soon you’re going to start noticing the inevitable slide. You can’t duck this. There’s no way around it. You simply have to get your head around the fact that one day in the near future, you will have to take the step into e-reading. That could be sad or even really bad news for you, and I hope I’m not the first to have the guts to break it to you. However, it’s probably better that you choose your own time and place to trade over to e-books than have e-books forced upon you and resent it. Take back control and pick your own ground. Make the change for yourself, on your own terms, and you’ll feel so much better about it. Next: Do I Have To Buy Indie Books?